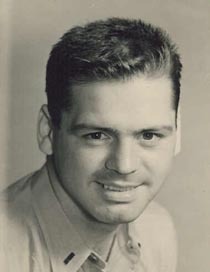 Robert D. Clark served as a naval aviator in the Pacific after enlisting in the U.S. Naval Reserves in October 1942. He completed pre-flight training at Athens, GA, and received his wings on April 16, 1944 in Pensacola. After undergoing training in night attack and combat tactics at Quonset Point Naval Air Station, Charlestown, RI, he reported for duty with the Pacific fleet in February 1945. He was assigned to the Fighter Squadron VF-87 based on the aircraft carrier the USS Ticonderoga. He was a pilot of the Grumman F6F-5N, or Hellcat. He saw duty in the Philippines, Guam, and the Sea of Japan. He was in Tokyo Bay on the day of the surrender and was among the first servicemen to go ashore in Tokyo. After being released from active duty in September 1945, he remained in the Reserves was recalled for duty in Korea in October 1951. However, because a cornpicker accident in 1948 severed the fingers on this right hand, he was granted a medical waiver and the Navy released him from active duty. As a night fighter, Ens. Clark flew missions at night, taking off and returning to the carrier deck in total darkness. He once commented to Don Rhoads, that it was "the loneliest feeling in the world to be out over the Pacific, looking for your carrier." 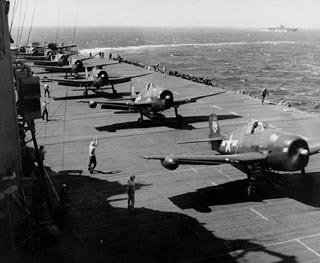 Grumman F6F's (Hellcats) prepare to take off from the deck of the aircraft carrier USS Ticonderoga (Navy photo 80-G-305244). 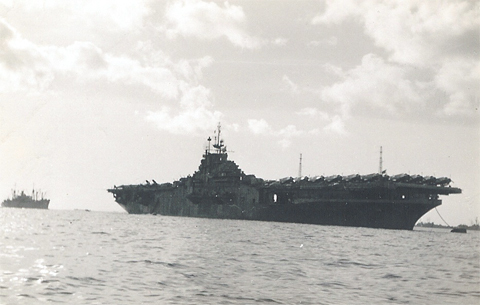 USS Ticonderoga comes into harbor for repairs at Guam. (photo courtesy of Gene Loveland, member of VF-87). 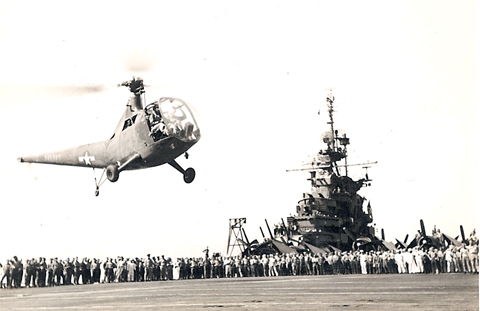 U.S. Army helicopter comes on board the Ticonderoga (photo courtesy of Gene Loveland, member of VF-87).